A painting looking West from the Churchyard of Shoreditch Church. Sign up to my newsletter and you can enter the free draw to win this original preparatory painting worth £100 of Shoreditch, London. 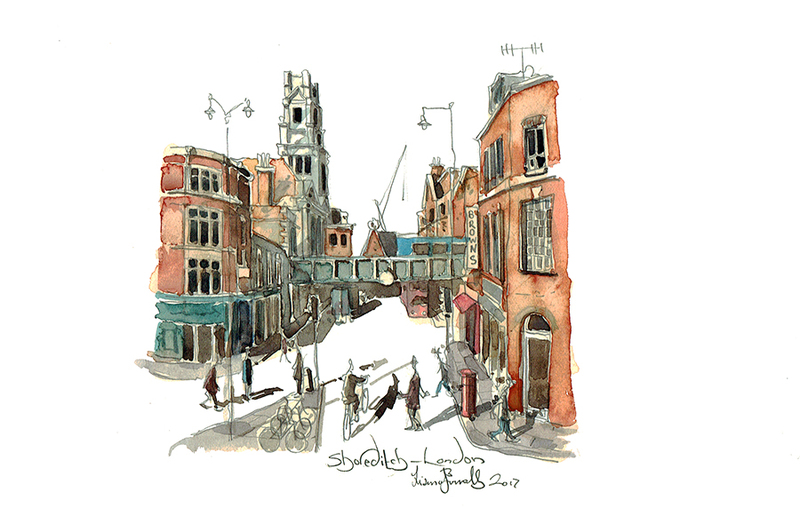 This watercolour study of Shoreditch is 14cm x 16cm, signed and mounted on acid-free card. The newsletter will be sent out on the 18th August 2017. I look forward to your sign up in the box on this page. I was commissioned to paint this junction of Shoreditch High Street. My client spent many years living in an apartment on this junction, and wanted a memory of it. Today, it is party central with a bar, club, coffee shop or nightclub on every corner. Oh mustn’t forget the arty book shop. It looks like it has always been there. This, however, is not the case. It seems just a few short years ago since I visited the Comedy Cafe on Rivington Street on a Saturday night, and Shoreditch was like a deserted dystopian world, lit only by the single red neon light of the lone comedy night spot. You would casually come across Banksy graffiti on dark walls, many pieces lost forever by over zealous council cleaners. The most famous being a 2002 piece featuring Pulp Fiction characters pointing bananas instead of guns. This was painted over by London Transport workmen despite being worth more than £300,000 at the time. A Transport for London spokesman said “Our graffiti removal teams are staffed by professional cleaners not professional art critics.” Very London! As I did this visual in February, it was pretty cold so I fortified myself with coffee first to keep me warm. Yes, ‘Artisan Coffee’ served by someone sporting a woolly beard and covered in tattoos. The view is facing West from the Churchyard of Shoreditch Church (as in” when I grow rich say the bells of Shoreditch”, from the nursery rhyme Oranges and Lemons). I liked this view as the railway bridge cuts nicely over the road, and in the background you can see Shoreditch Town Hall peering over the top. I was pretty pleased with it and though the client didn’t choose this particular route, I think I may do a final piece anyway and pop it onto the site to sell. Once you are signed up you get entered into the newsletter every month if you apply. I don’t announce them each month as I’m conscious of their anonymity. That said I do ask them to put it on Facebook etc. Some do im pleased to say.